If you love beets, then you’ll love this flavor-packed tropical-inspired salad. Ideal served as a light appetizer; alternatively, double-up the ingredients for a quick and easy lunch. Courtesy of chef Johann Piscoya, of The Ritz-Carlton, Grand Cayman. Cook the beets until tender. Once cooled, peel and set them aside. Take one of the beets and blend with one of the passion fruits. Strain the mixture and reduce by half on low heat to create a purée. Allow the mixture to cool and set aside, ready for serving. Take the remaining beet, chop into cubes and mix with 1 tablespoon of olive oil. In a mixing bowl, strain the juice from the second passion fruit and, using a whisk, mix in the remaining olive oil. Season with salt and pepper. Set the dressing aside, ready for serving. 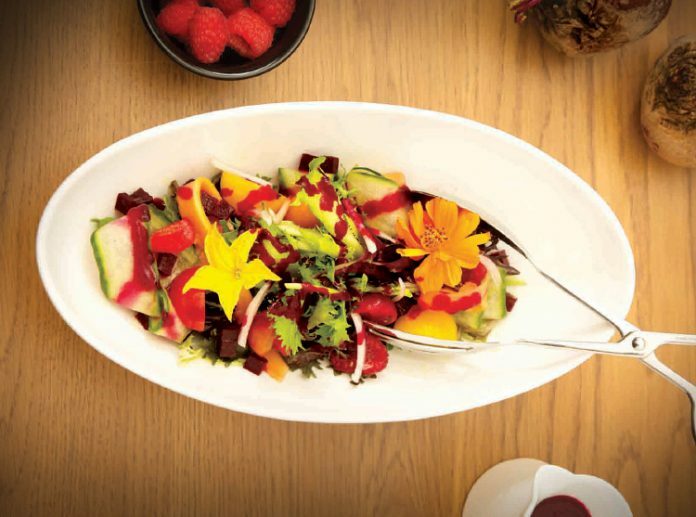 To serve, place the chopped beets at the bottom of the plate. Top with the mixed lettuce leaves, tomatoes, papaya, and cucumber. Drizzle the dressing over the salad, and then garnish with the raspberries. Serve with the beet and passion fruit purée.